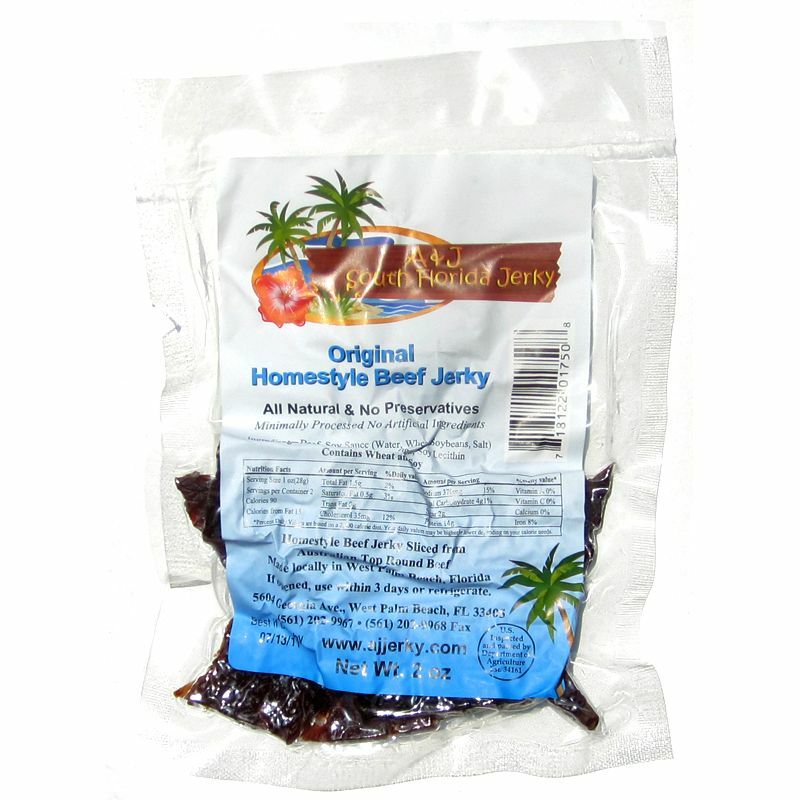 A&J South Florida Jerky is a brand of A&J South Florida Jerky, Inc. based out of West Palm Beach, FL. The brand has been around since 2006. It's run by Andy Cohron and Jim Torhorst, a couple of buddies who had been making jerky for themselves and friends over the past 15 years, but decided to turn it into a business. In 2007 they became USDA approved and then incorporated. A&J South Florida Jerky is largely available in 300 retail outlets mostly in Florida, along with 30 Crown Liquor stores. They also sell jerky from their website, and they're already private labeling for other brands. Beef, soy sauce, sugar, garlic, black pepper, ginger, soy lecithin. The first thing I taste from the surface of these pieces is a slight sweet, followed quickly by a light saltiness, and then some soy sauce soon comes in. The chewing flavor starts with a more defined soy sauce flavor, while the ginger becomes noticeable. Lastly, the natural meat flavors show up. 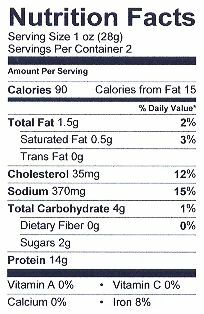 The ingredient that seems to define the overall flavor of this jerky seems to be the soy sauce, but not at an intense level. It's a mild flavor, and for a jerky that relies on a soy sauce marinade, this one is not really that salty. In fact, the salitness is still quite noticeable, but at a moderate level. Jim also explained that he doesn't add salt, using only what salt is in the soy sauce. The ginger seems to play a big role in the overall flavor as well, being mostly noticeable in the chewing, and perhaps becoming a little more noticeable as the sweetness wears off. The sweetness is just there in light amounts, not really defining this jerky but only there to soften the flavor and maybe add a touch of body. Lastly, the natural meat flavors make a showing, but initially only in light amounts. But as the chewing continues, particularly in the last few chews, it becomes much more noticeable perhaps as the other flavors wear off. But combined with the soy sauce and ginger, it ends up tasting similar to stir-fried beef. Overall, what you're going to notice in jerky is a mild soy sauce flavor, with an easily identifiable ginger. There's a medium level saltiness, and then some natural meat flavors showing up towards the end. This is a dry jerky but with a lightly sticky-oily surface feel. They have little flexibility in that they easily crack open and break apart with some bending. Biting off chunks seems somewhat easy, and chewing seems somewhat easy as well. 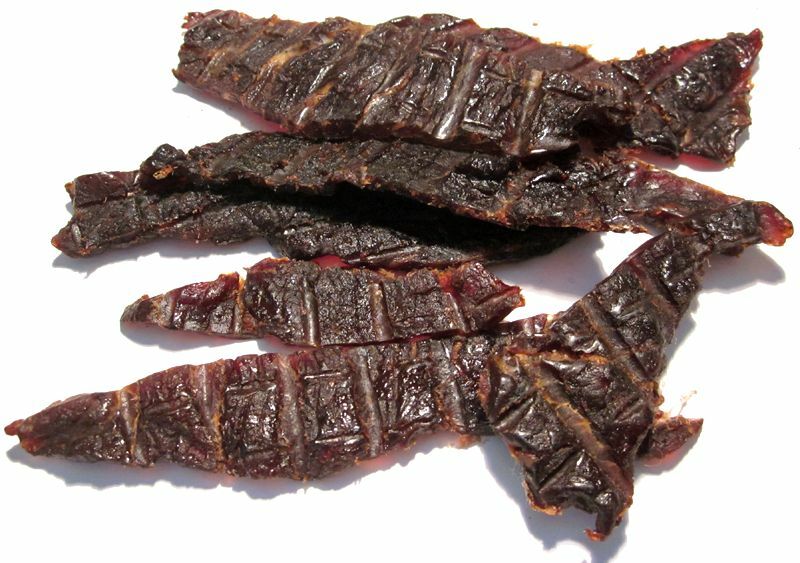 The chewing texture of this jerky starts out feeling stiff and slightly brittle, and doesn't put up much initial chewing resistance, breaking apart in a few chews. It actually starts to feel crumbly. As it continues to chew down to a soft mass, it takes on a steak-like feel, but still has crumbly nature. 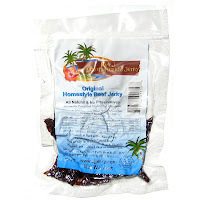 A&J South Florida Jerky sells this Original beef jerky from their website at a price of $4.50 for a 4oz package. If you bought four packages (sent to Southern California), they tack on sales tax of $1.17 plus $5.00 shipping, for a total of $24.17. That works out to $1.51 per ounce. For general jerky snacking purposes, at the $1.51 per ounce price, it seems to present a good value. I'm getting a decent amount of snackability for an overall good flavor, and being easy to eat, but with a somewhat crumbly texture. But that price is considerably lower than what you'd pay for major brands of jerky at the grocery store, and yet it provides a little more snackability. I'm giving this an good rating. This Original variety from A&J South Florida Jerky has a nice savory flavor with a mild soy sauce marinade and an easily noticeable ginger, along with a touch of sweet. It's not as salty as a lot of other soy sauce marinated jerky brands, and it does provide a light natural meat flavor that actually becomes more noticeable in the latter part of chewing. 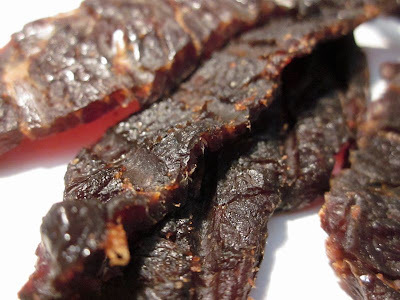 The soy sauce and ginger actually combine pretty well with the natural meat flavors to give this jerky an Asian flavor that resembles stir-fried beef. The meat consistency is somewhat easy to eat, but the chewing texture is lacking, often times feeling too crumbly, or somewhat crumbly. Even though sometimes it had a steak-like feel, there was still a crumbliness that lingered. Compared to the other brands of Original flavored jerky, it seems to be above the average lot of brands, particularly with the stronger dose of ginger and the natural meat flavors, but I'm still not finding anything that really strikes me with a "wow factor". Overall, for an Original variety, it's good.